T/O Marham 23u.45 - target, enemy transport in the Cambrai - Le Cateau - Cambresis - St. Quentin triangle, (France). 77 aircraft from 92 despatched (32 Wellingtons, 24 Whitleys and 18 Blenheims) continue the RAF's attempt to halt the German advance in northern France. (Source: Bomber Command Campaign Diary). Schoonselhof Cemetery Antwerp - Coll. grave IV.E.12. 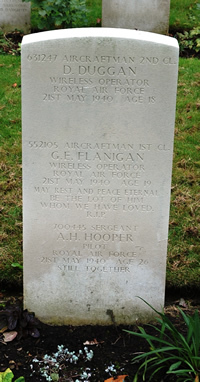 Son of Harold Alfred Hooper, and of Lilian Hooper, of Wolverley, Worcestershire. Son of Joseph Hughes, and of Augusta Eleanor Hughes, of Patcham, Brighton, Sussex. Schoonselhof Cemetery Antwerp - Coll. grave IV.E. 12. 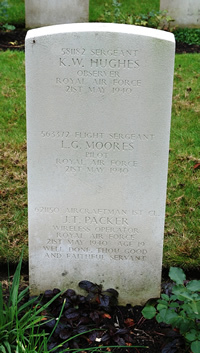 Son of William and Mary Alice Packer, of Sunderland, Co. Durham. 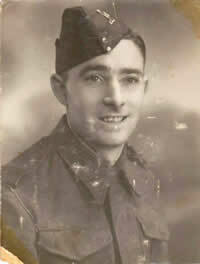 Son of Michael and Henrietta Flanigan, of Middlesbrough, Yorkshire. Son of Mr. and Mrs. Douglas Duggan, of Murton, Co. Durham.